I have J Sheekey and Marco Pierre White to thank for the inspiration for this fabulously luxurious dish. I hope you like my interpretation. I advise you use the best champagne and caviar you can reasonably buy. It seems most befitting that the oysters I used for the photograph are from Bigbury Bay, the very bay associated with Burgh Island. Anyone who has ever stayed or simply dined in the famous Burgh Island Hotel will know of the extraordinary Art Deco elegance that formed the backdrop of Agatha Christie’s Poirot mystery Evil Under the Sun. The approach to the hotel is via a causeway or via the famous sea tractor, the only one of its kind. My experience in the restaurant was outstanding and comes thoroughly recommended. Shuck the oyster shells retaining the juices. Carefully separate the oysters from their shells. Rinse and dry the shells. In a small pan, bring the champagne and oyster juices to a simmer. Reduce the liquid by two thirds. Add 30 mls of the cream and reduce further by a half. Warm half the butter in a separate pan. Add the whisked eggs and remaining cream and stir until the scrambled egg is thickened but still runny. 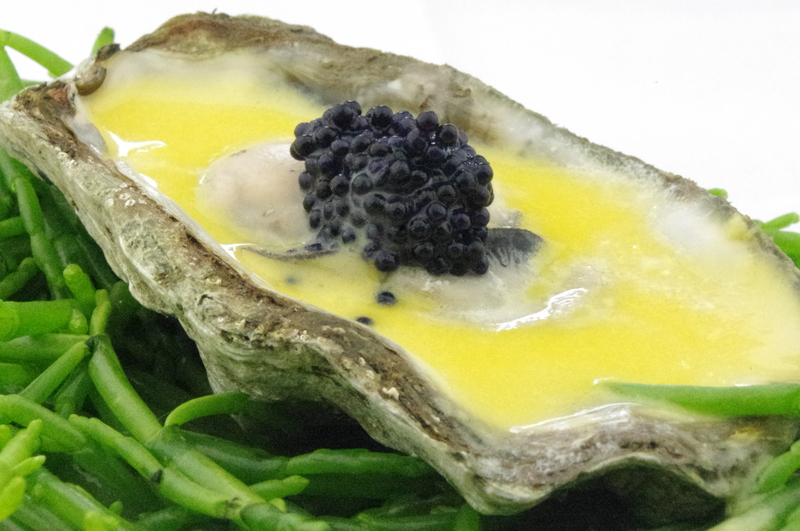 Warm the oysters gently back in the champagne oyster cream. Pour the scrambled egg into the base of an oyster shell, add an oyster then pour a little of the champagne cream over it. Finally place a small amount of caviar on top of the oyster. Serve with a teaspoon. Enjoy. Fabulous looking recipes Adam and when I have a few days off work I will be tempted to try a few-my family will think I have a guilty secret if I produce food that looks as good as yours ! I would however be interested if you could suggest some desserts too-you can’t beat a pudding! !